This was my Twelfth Night dessert on January 6 2015. I celebrated the Twelfth Night of Christmas with a group of my old uni friends and a few others. I wanted to make something Christmassy but we were all over Christmas cake, pudding and trifle. 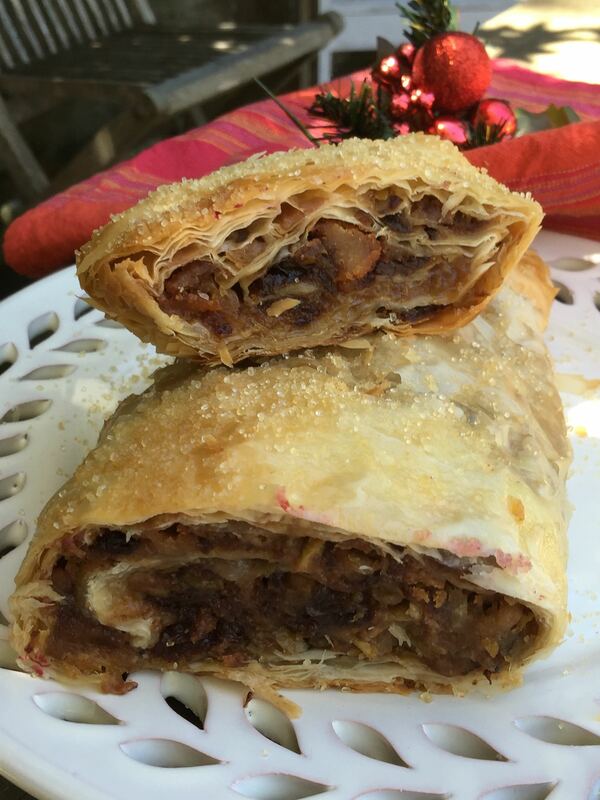 I had been fascinated by one of Jamie Oliver’s Christmas specials in which he created a Christmas Pudding strudel. 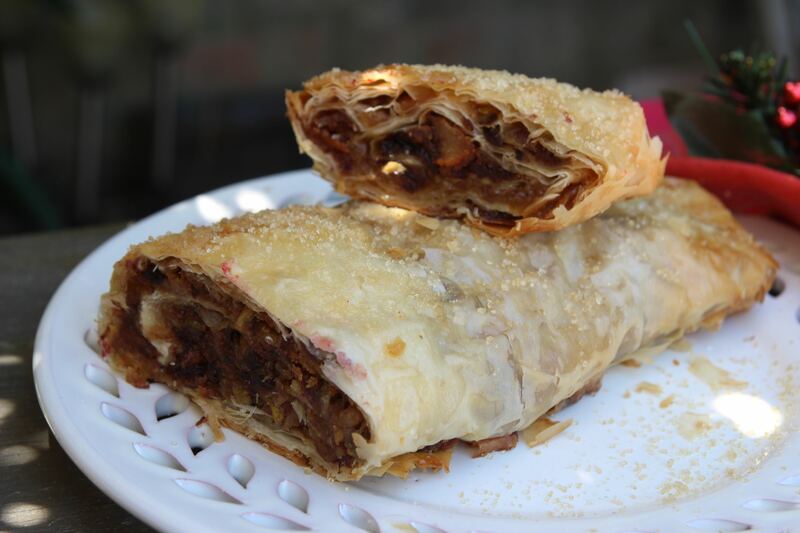 It’s basically layers of filo pastry, filled with grated apple, pear or quince, crumbled Christmas pudding and a surprise chocolate centre. This is a delicious way of using left over Christmas pudding. I had made a lovely rum and pineapple Christmas pud (see here) for Christmas day, along with an ice cream version. The pineapple one was very big, and so we had heaps left over. Now seemed the appropriate time to try Jamie’s recipe! I used grated pear in my strudel. I think in retrospect I could have done with less filo layers – 12 all up was a bit much! The chocolate centre was a hit plus lots of demerara sugar on top gave a great crunch. Preheat the oven to 180 degrees C or 160 degrees C fan forced. Lay out 6 sheets of filo pastry on a clean tea towel, overlapping each by an inch or so, so they cover the tea towel. The filo should cover the tea towel completely, with just a little overhang at one of the shorter ends. Work quickly so your pastry doesn’t dry out and brush some melted butter all over it. Sprinkle over the cinnamon and 50 g of the sugar, then crumble over your ginger nut biscuits to add crunch. Carefully layer the rest of the pastry sheets on top and brush again with butter. Use your hands to crumble the Christmas pudding into a bowl then grate in the fruit, everything except the cores. (Jamie says to use the cores – I don’t think you need them.) You want to have about the same amount of grated fruit as you’ve got pudding. Add about 2 tablespoons of sugar, and mix it all together to break up the pudding a bit more. Sprinkle this all over the pastry so it’s roughly covered, leaving the overhang clear. Place the chocolate in a row on top of the Christmas pudding, down the short side nearest the overhang. Fold the overhang over the chocolate and pinch it up, then lift up your tea towel, and use it to help you carefully roll up your strudel. Tuck the ends under to seal it and transfer to a large nonstick baking tray. Brush it all over with butter then sprinkle over a little more sugar. If it looks a bit rough, you could wrap an extra layer of filo round it before cooking to make it neater. Bake in the hot oven for about 40 minutes until crisp and golden. You may get a split once cooked – I agree with Jamie that that would add to the rustic effect! Leave to cool, then use a serrated knife to cut the strudel into 5 cm slices. Note: This recipe makes quite a large strudel. The photos were taken AFTER my Twelfth Night celebration – what was left is about half of the original. Posted in Cakes, Jamie Oliver, Sweet Food and tagged apples, chocolate, Christmas pudding, Jamie Oliver, pears, quinces, strudel, Twelfth Night. Bookmark the permalink. This looks amazing. I’m suddenly very hungry!